With it's modern contemporary looks the Professional Plus 90 range cooker offers a 5 zone ceramic hotplate delivering impressive heat-up times and responsive controls. Ceramic hobs are also relatively easy to clean compared to their gas counterparts and benefit from ‘hot hob’ indicators for additional safety. Boasting two generously sized electric fan ovens, the Professional Plus 90 can easily cater for a family, enabling the cooking of multiple dishes at the same time. Both ovens have catalytic liners which greatly reduces the amount of cleaning required to just the base and door. The left-hand oven with it's glass porthole door also has the innovative handyrack which means no more burning your hands reaching in to the oven cavity to check your roast. It atttaches to the main oven door and gently pulls the roasting tray out as you open the door and will support a roast weighing up to 5.5 kilos safely. The tall right hand fan oven has four shelves making it perfect for batch baking or family pizza nights in addition to everyday use. The Rangemaster Professional Plus also features the upgraded Glide-out grill gliding smoothly out on telescopic runners, making it easier to check on your food safely by eliminating the risk of pulling the grill pan out too far. The dual circuit grill has both full and half grill settings for both ease and ecomony. 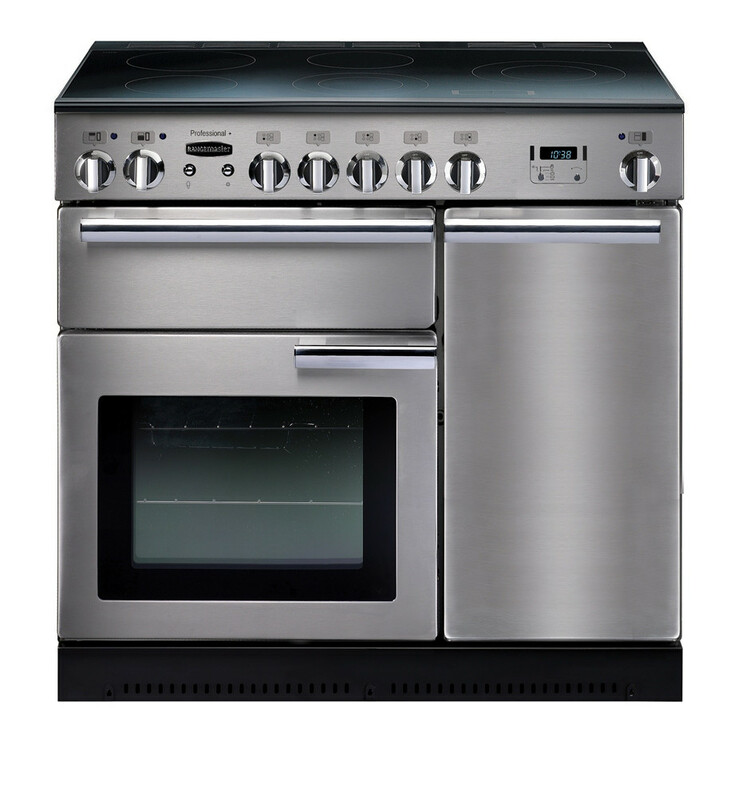 Available in a choice of colours there is a Rangemaster Professional Plus 90cm Ceramic Range Cooker which will look perfectly at home in any kitchen. Choose from black, cranberry, cream or stainless steel, all with a stylish chrome trim. Looking for even more functionality or colour options in your Rangemaster then please take a look at our blog to see the additional features and key differences the Professional Deluxe version offers.